As usual, my art history class has got me thinking about, well, art, which is what it’s supposed to do. More specifically, it has me thinking not so much about the art that hangs in the great museums of the world, but rather the art that hangs on my walls. I should say the art that doesn’t hang on my walls. 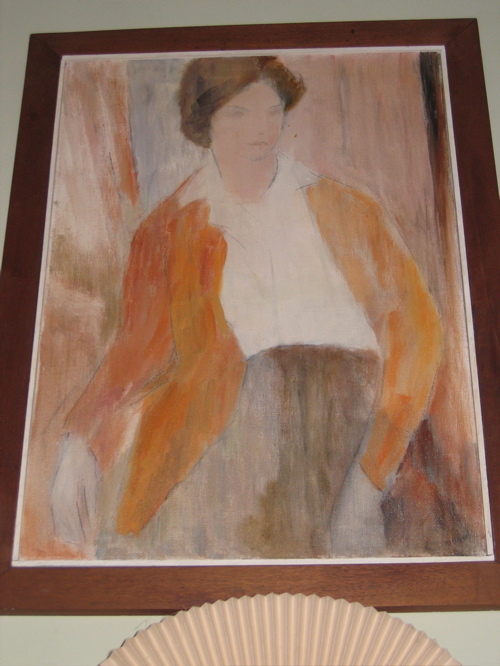 While I like my mom’s portrait, I’d like one of those staircases lined with ancestral paintings. Does anyone do those anymore? Or is it too passé? 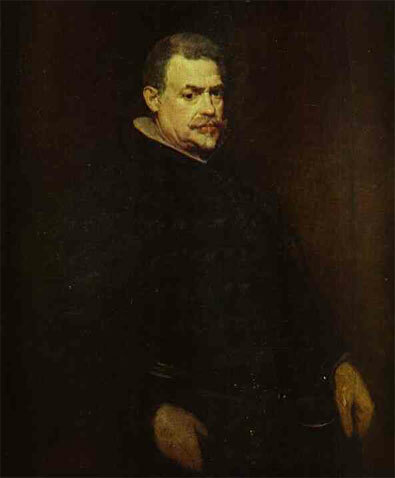 Mrs. E. negotiated the sale, by letter and phone in Spanish, of a large portrait of a Spanish Officer ca. 18~~ for the architect. It hangs at the club and gives the place a certain air. Probably because it took a year to get here from Madrid. So, do you have a rogue’s gallery on your walls? And are they your ancestors? Or do you, like I, rely on black and white photos? I think it’s time to seek out Wm., Lord Largecastle and Great Aunt Martha at the local antique shows. It seems that I will have to get my ancestors the new way, and not by inheriting them. 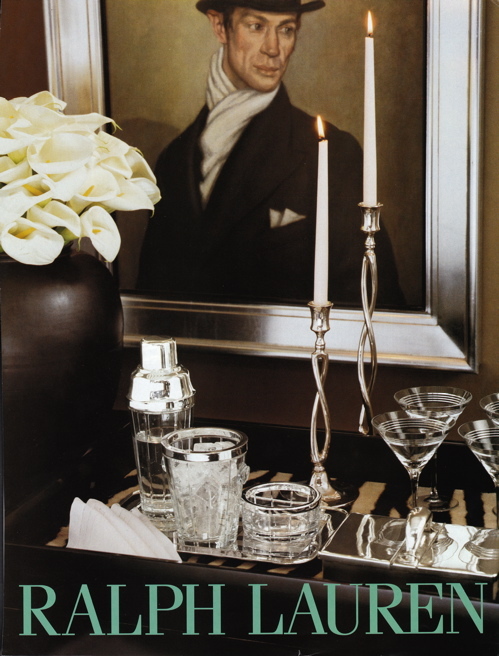 This entry was posted in Living and tagged art, decorating, Living. Bookmark the permalink. Luckily, my grandfather was quite an accomplished local painter and I received quite a few of his paintings when he passed. We have strewn them throughout the house; however, I have always wanted to congregate them at the top of the stairs for a more dramatic look. I might have to give that a try. We have a few 1800’s oil portraits that I am hoping to end up with. The idea of instant ancestors is a little odd to me, but I understand hanging them solely for the art. But if someone offered me a Sargeant painting, I’d take it in a split second! 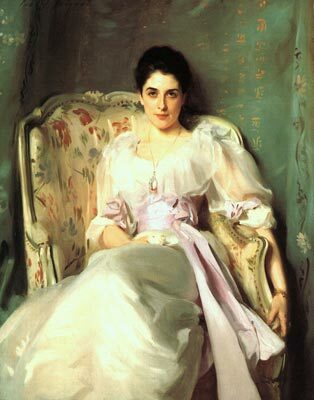 I have a wonderful oil painting, executed in the mid 1930s, nearly life-size, depicting a slender stylish woman of middle age—seated in a chair, wearing an icy lavender gown, with an ermine-trimmed cloak thrown over the back of the chair to reveal a jade-green lining … It is the only oil portrait I have and weirdly, it resembles my maternal grandmother, a farmer’s daughter/coal miner’s wife from West Virginia who could only have dreamed of wearing such a gown or sitting for a portrait … which is why I like it so much. Plus, the color combination is thrilling to me. I just haven’t found the right place to hang it. I stuck it in a lavender-painted bedroom for a while, but it isn’t quite right. Perhaps the dining room would be a better place, or the library. All successful people have portraits of dead people, related or not. I used to think that they were sort of gross, but now I love them, I speak to them as I pass by. They add an old money quality to the air. The men were in better shape, because they were well hung, while the ladies were put in the attic. Oh, did I really just write that, tee hee. Mona Lisa watch over me any day. Ah, Mr. Blandings, Jr. hangs in my office. He’s stately and handsome with his crisp white shirt and watch chain. 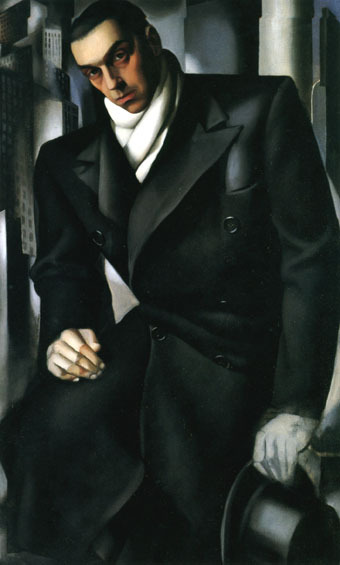 I like the portrait the most because Mr. B resembles him, though most folks think he looks like III. It’s a bit of continuity, I guess. Portraits of my family are only photos. The best is my grandfather and his siblings all barefoot on the front porch of a place my children would be afraid to go into. I like it just as well. The art our our walls tends toward the pastoral, though we do have a gorgeous painting of a snappily dressed party at some type of card game. Poker? Bridge? Go fish? I can’t say for sure but I do enjoy it. In the coming years (when we have more wall space than our current condo affords) I aspire for the art on our wall to be a mix of vintage finds and photography I’ve done myself. I may even let a sentimental wedding picture slip in from time to time. I can see why you would continually tear out the Ralph Lauren ad. Does anyone create a more perfect setting?